Dyslexia is a learning difficulty that largely affects skills involved in reading and spelling. Dyslexic children have difficulties with phonological awareness, verbal memory and verbal processing speed. Dyslexia does not affect a persons IQ, in fact dyslexic people are often very intelligent and creative. If you need convincing check out our blog on famous dyslexic people! Over the years we have come across many different aids aimed at dysleixa, some of them work, some of them are not helpful at all. Here are five aids we have come across that we would recommend. These have to be our number one suggestion for aids to help a dyslexic child. Dyslexic children often suffer from visual stress problems meaning reading become a laborious task. Research has proven that text written on different coloured paper can really improve a dyslexic child’s reading. It makes the words clearer and even stops the words and letters moving around in front of their eyes- a very common problem associated with dyslexia. However it is impossible for every piece of text to be printed on the appropriate coloured paper. The solution to this is to always having a coloured overlay to hand. This is where the Eye Level Reading Ruler comes into its own. They are about the size of an eight inch ruler and highlight the section of text you want to read. It can be used on single sheets, books and even over a computer or tablet screen! Different people require different colours, and even then this may change over time as the brain develops. At Smithbrook Tuition we hold all the colours for your child to try out quickly and easily to decide which one is best. Please ask Sue, next time you are in, to try out a reading ruler and find which colour suits you best! 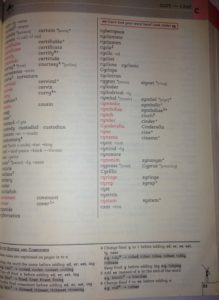 Dyslexic students often spell words very differently and a normal dictionary is not always going to help if the attempted word is spelt phonetically. Due to unusual spelling attempts, even spell check on a computer may not be able to detect which word they are trying to spell. That’s where a dyslexic dictionary is invaluable. Students can look up a word as they think it sounds – if they are correct, their spelling will be confirmed but if they are wrong they will find the incorrect spelling with the correct spelling alongside it. 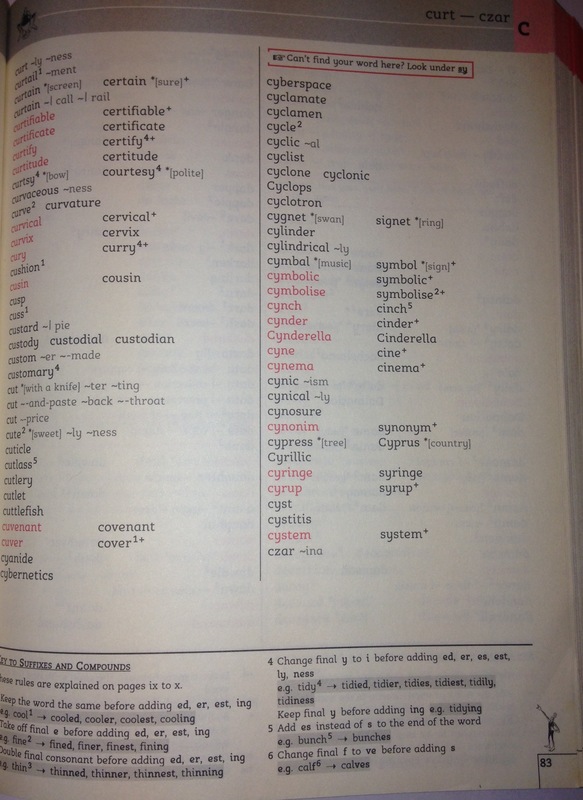 The latest edition is called School Spelling Dictionary by Christine Maxwell. It is a revised edition of the best seller that we use at our centre Dictionary of Perfect Spelling. The School Spelling Dictionary is published by Barrington Stoke who specialise in books for reluctant, struggling and dyslexic readers from Key Stage 1 and beyond! This handy device will help your child write with confidence. It is ideal to use in the classroom or at home as it is small, unobtrusive, and less cumbersome than the dictionary. These spellcheckers phonetically correct thousands of words, e.g. from FIZIX to PHYSICS, indicate common spelling errors, give definitions, and even contains word games to help build up a spelling reportoir. There are many available on the market and they are a really helpful way to enable a child to keep up in the classroom. The Collins Spellchecker also features metric conversions and at under twenty pounds could be just the thing to help a dyslexic child with their work. We use these in our centre and children of all abilities love using them. They are a fun and stress free way to help develop creative writing skills. 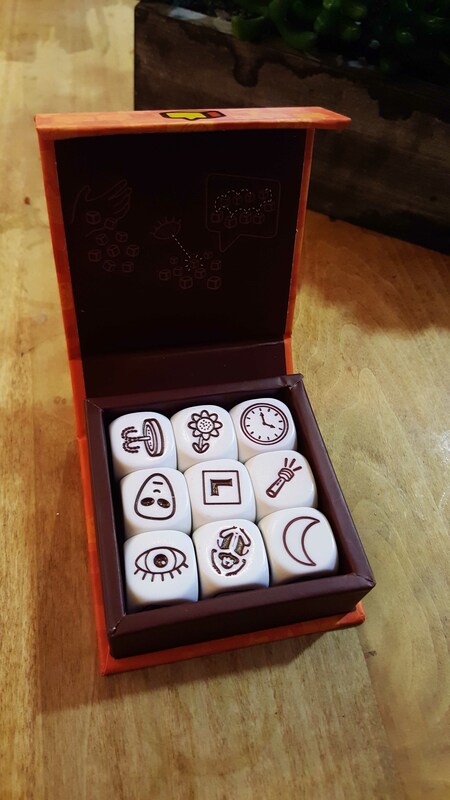 Just roll the cubes and let the images spark your imagination. Anyone can become a great storyteller with these Story Cubes. They can be used individually or amongst a group of children. 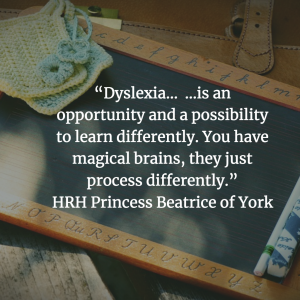 The benefits are that they help improve literacy development, speaking skills and problem-solving, by using the creative strengths of a dyslexic child’s brain. These books take popular children books and develop them for readers with Dyslexia and Dyspraxia. The books are published in a special font, typesetting, paper and layout, with a glossary, based on research from the University of South Wales, into how to improve a reading experience for dyslexic children. These books are endorsed by British Dyslexia Association who see them as a great way to engage children with learning difficulties “a marvellous initiative opening a world of pleasure for dyslexic children and giving them great motivation to persist with reading which will improve their skill”. What book is hot right now? Most children love anything to do with Harry Potter and while you can find all the HP books in large print we have found that the Fantastic Beasts And Where To Find Them orginal screenplay is available in large print too! Dyslexic children are creative and often theatrical. Having the script available in an easy format can really indulge their creative sides and bring the magic alive from page to screen. Online and highstreet retailers stock large print books. Waterstones and independently owned bookshops are usually very helpful and will be able to order in books. However, large print books can often be quite expensive, so it would be worth checking which large print books are available at your local library, which of course is free (or see if the school library or special needs department have any). There are also specialst websites out there. Check out Books For All for specialist stockists. The above five items could really aid and support a dyslexic child with their schoolwork and brain development. However, dyslexic children often struggle with handwriting too and there isn’t really anything out there that can help with this. At Smithbrook Tuition, however, we offer short courses in handwriting and also touch-typing, which, when it has been learnt properly, is a useful skill that has been proven to help dyslexic children keep up with their peers in lessons and in exams.